For most of his life James T. Culbertson taught mathematics, computer science and philosophy at Cal Poly in San Luis Obispo, CA, but Culbertson's life-long passion was his struggle to discover how to give consciousness to robots and how to test for the presence of consciousness in beings, such as ourselves, who possess it naturally. His first book The Minds of Robots outlines his SRM (spacetime reductive materialism) model of awareness and his later books develop SRM in more detail. All of Culbertson's books are quirky, repetitive, difficult to grasp and have the feel of texts written by an obsessive genius. 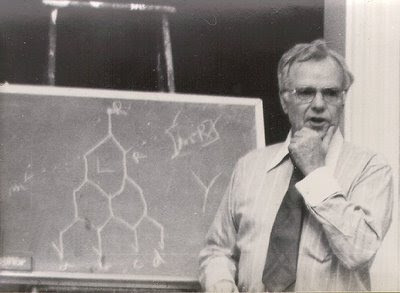 For many years my friends Saul-Paul Sirag, Jerry White and I corresponded with Culbertson, invited him to seminars and even spent a delightful few days in a trailer in back of Jim's house in SLO listening as the master expounded his eccentric model of mind. Jim once joked that I was the only one who understood his theory and he put the JTC stamp of approval on my bare-bones outline of SRM in Elemental Mind. In Jim's model of mind, consciousness arises from causal networks in spacetime. And since most of spacetime is criss-crossed with causal networks, consciousness is ubiquitous. Culbertsonian mind is a species of panpsychism. But most of this universal consciousness doesn't go anywhere; it just sits there in spacetime as isolated bits of experience. No memories, no sense of self, no flow of time. But just as material atoms can be used to build complex structures, so can Culbertson's atoms of awareness be linked into more complex experiences somewhat resembling the kinds of consciousness we humans enjoy. Some of the details of how to build more complex minds out of elemental experiences can be found in Culbertson's Sensations, Memories and the Flow of Time (which JTC fans refer to affectionately as SMATFOT). At present we are entirely ignorant as to how consciousness becomes present in the material world so Jim's elaborate guess is as good as any. Its complexity and quirkiness may argue against it but SRM has one attractive feature that sets it apart. It offers a mechanical method for testing for the presence and the quality of consciousness in other beings. In Culbertson's model it is possible to create a network of "clear loop links" between the networks that constitute separate minds in such a way that each mind will directly share the experiences of the other. Thus, using what I have elsewhere called "Jim Links", Culbertson's model has solved in principle the philosophical problem of "Other Minds". Does a cat enjoy an inner experience? Does a blade of grass enjoy photosynthesis? With a Jim Link these questions could be answered directly. As Culbertson once put it, the privacy of inner experiences is a mere biological accident and could in principle be overcome by technological means. Whether Culbertson's theory is viable or not, it sets a high standard for any rival model of mind: does it satisfy the Culbertson Criterion? Can it be tested by constructing mind links between allegedly conscious beings? A world in which Jim Links exist would surely make possible new forms of both eroticism and interrogation but I suspect that the Opening Up of Inner Space to Direct Exploration will be the most profound event in human history, changing the human species beyond recognition. Thank you, dear Nick Herbert, for your friendship to my father, Jim Culbertson. I happenned to stumble across this (although I have visited your website purposefully in the past), and truly loved reading this obituary, the most clever one I've read yet. As always, you do truly understand Dad. It was a joy to open this page and see my Dad's smiling face. I hope life is treating you well. I found somewhere that your James T Culbertson was born in Nebraska, where mine seems to have been born in Pennsylvania. So, it’s is probable that they are not the same person. But, in the interest of accuracy I was hoping you could help resolve this for me. @David Culbertson, Yes, I believe they are the same person, and we must share a common ancestor. My grandfather's mother died when he was two. He was the youngest child. I forget how many siblings, but one was named Walter. They lived in Pennsylvania. Your grandfather was the greatest professor I have ever had. I took courses from him in introduction to philosophy, ethics and logic. We used his text "Mathematics and Logic for Digital Devices," in logic. That book ultimately allowed me to succeed in two years of calculus and differential equations,as well as in several computer science courses. I think of him often and am proud to have been one of his students. To Richard Glenn: Thank you for your kind words. They mean a lot to me and those who loved him. He spoke of his students often; he loved them. John Madden is probably his most famous student. Of him, he remarked "he was well prepared". I am happy Baba's book helped you. I have yet to read it, but I will. The old house in San Luis Obisbo is up for sale now, and my aunt recently sent me some of his work, several boxes I have yet to go through. I have three degrees in science and engineering, so hopefully I will be able to appreciate what I read. I miss him, and I wish I had not lived 3000 miles away, because I only got to see him a handful of times, mostly in the Summers when school was not in session. Thanks again, for sharing your story. Happy Birthday, Quantum Tantra Blog!